Although business technology is designed to make life easier in the workplace it can be abused, and a staff policy is the best way to avoid this. Having a set staff policy can help avoid disciplinary proceedings against workers who spend work hours surfing the net or instant messaging friends. Internet abuse at work has become one of the biggest reasons for disciplinary cases in the workplace. In fact recent reports state that these disciplinary cases are greater in number than all other disciplinary reasons put together. Whiling away the office hours away surfing the net and sending non work related emails has become a serious problem in offices around the UK. So much so that staff policies on this type of technology abuse are given to staff to be read and signed on the first day of employment. Non work related internet and email use. Personal telephone calls during work. Personal use of technology such as photocopiers. Non work related use of computer technology such as copying CDs. Instant messaging to friends during work hours. The cost of internet abuse is not just measured in terms of wasted work hours and loss of productivity. Internet abuse can lead to viruses crashing networks and spam emails flooding business email addresses. Sharing confidential work files and downloading music and illegal images have all result in employees being dismissed from their jobs. These are only a few of the reasons why employers now take technology abuse very seriously. Almost 20% of companies in the UK monitor the internet usage of staff on a regular basis. Many employees are unaware that internet monitoring actually exists and are taken by surprise when asked to explain their behaviour. However 90% of UK firms do have guidelines set in place regarding technology abuse and employees are made aware of these policies. Two thirds of UK companies see employee abuse of technology as gross misconduct in the workplace. Business owners can draft their own technology abuse staff policy from scratch but there are plenty available to buy on the internet. The staff policy should set out in a clear manner exactly what staff can and cannot do with regards to the internet, emails, and other non work related use of workplace technology. In most cases employers do not mind infrequent use of the internet by staff but infrequent use is hard to define, especially if the case goes to a disciplinary hearing. Many companies simply ban the use of internet by staff. For some companies this is not an option as emails and the internet are used as business tools. However there is software available that can restrict internet usage and the websites that can be viewed. Staff should be made aware of this in the technology abuse policy. The policy should also include the disciplinary procedure process for any employees that are found to be abusing workplace technology. In most cases employers are well within their rights to discipline staff that send out personal emails using the company's internet facilities. 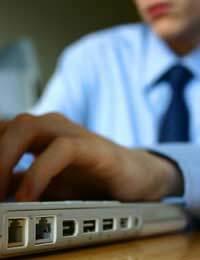 Personal emails sent using business systems will usually have the business name on them. It can then be said that every email sent out has been endorsed by the company. This can be bad news for the company if the content of the email causes offence to its intended recipient. Staff should be made aware in the policy that their internet activities are being monitored. The threat of disciplinary action should make internet abuse much less likely to occur. Technology abuse in the workplace is a very serious issue, and although a staff policy may not eliminate the problem it should help reduce it. A staff policy will mean there is a reference and guidelines set in place that can be used if any disciplinary action is to be taken. Informing staff that internet usage will be monitored and disciplinary action taken is one of the best deterrents against abuse of workplace technology.